A £50.00 non returnable deposit is payable at time of booking, for short break, £100.00 for full week (this securing the dates you require) and the remainder is due 3 weeks prior to your holiday start date. please state the number of people staying in the caravan and if linen is required. Elie Holiday Park is situated on the East coast of Fife, suitable for visits to St Andrews, Dundee, Edinburgh and Anstruther's famous fish and chip shop. Elie Holiday Park is a family caravan park that has its own private award wining beach, a club house, an on-site restaurant, café, and take away food. laundrette and shop. 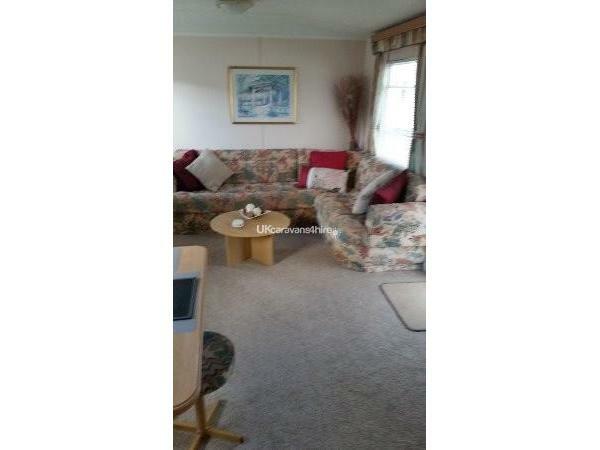 The caravan site has a lovely club house and offers a good selection of entertainment to suit all. 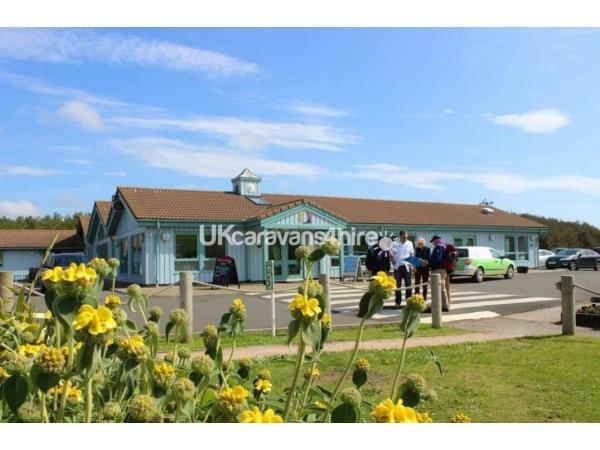 The caravan park is in a great location as it is surrounded by lovely scenery including a forest and a sandy beach. originally known as Shell Bay Caravan Park. Elie Holiday Park is close to the Fife town of Elie, If you are looking for cosy local pubs and restaurants during your stay then a short walk will take you into Elie where there is a choice, plus some water sports are available in Elie Harbour. Anstruther, Kirkcaldy, St Andrews and Dundee are just some of the local towns that can be visited. There are a selection of walks that pass right by Elie Holiday Park which will take you on nature trails through the forests or along the beach, all suited for bird watchers, walking enthusiasts and nature lovers. Additional Info: Elie Holiday Park is situated on the East coast of Fife, suitable for visits to St Andrews, Dundee, Edinburgh and Anstruther's famous fish and chip shop. Just back from a fabulous stay at this caravan. Brilliant value for money. Myself and my 3 friends had a fantastic time. 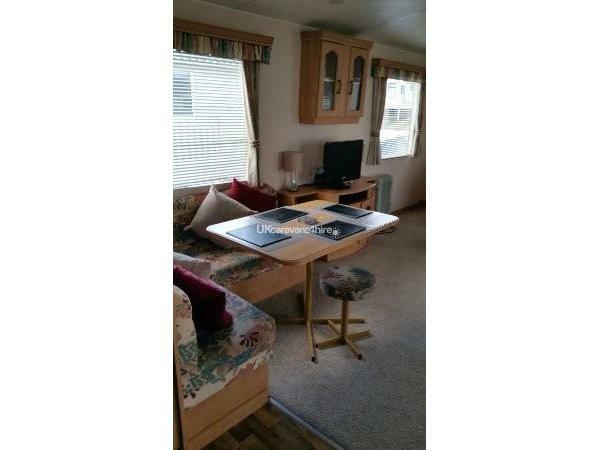 The caravan is clean, spacious and well situated at this beautiful site. Honestly couldn't fault it. Sharron was brilliant and very helpful. Thankyou! We hope to return. Just back from 3 nights here and couldn't fault it in the slightest. 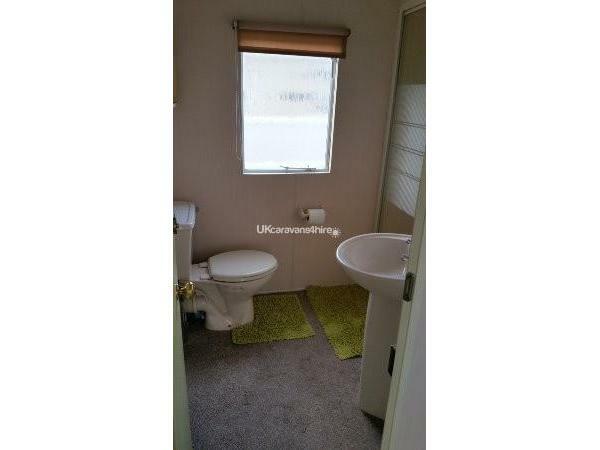 Clean, tidy and very spacious, the extra toilet was a godsend with 4 younger children! The caravan is equipped with everything you could need in a short break, and although we didn't need to, you get the impression that the owner Sharron would go out her way to provide anything extra you needed or asked for. Great location also in the park, quiet and perfectly safe for the kids to play outside the caravan, but just a short walk from all the parks facilities. Top marks all around!! Had a fab time with my kids caravan was clean everything needed that you need in a holiday home will definitely be booking again . We had a lovely stay in this caravan. 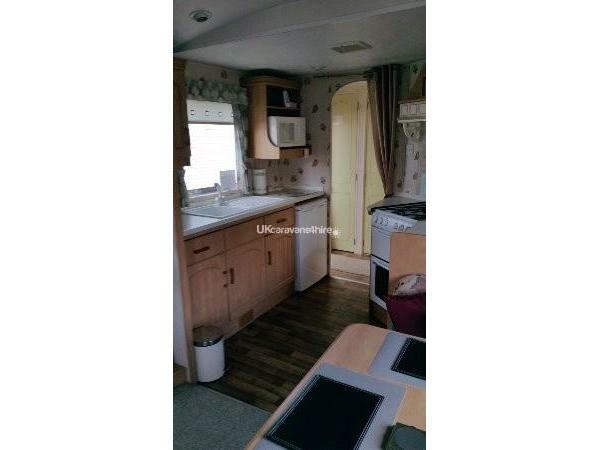 It has everything that you need with lots of thoughtful extras included in the caravan too. 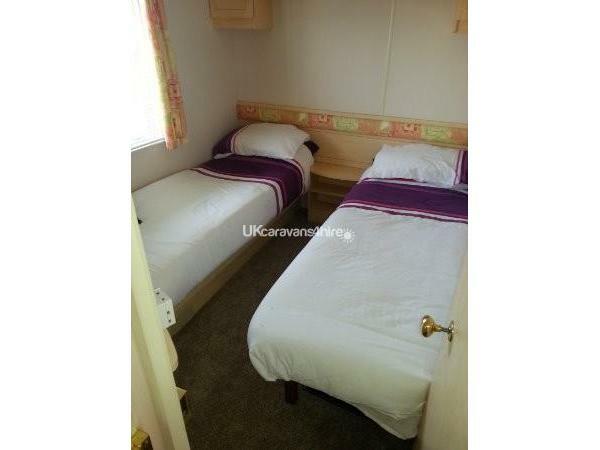 The caravan is very clean, spacious and is located in a nice quiet area (yet still close to park amenities and beach). We would highly recommend a holiday here. We stayed for 3 nights but could easily have stayed for much longer. Thanks!! Accommodation was great .. 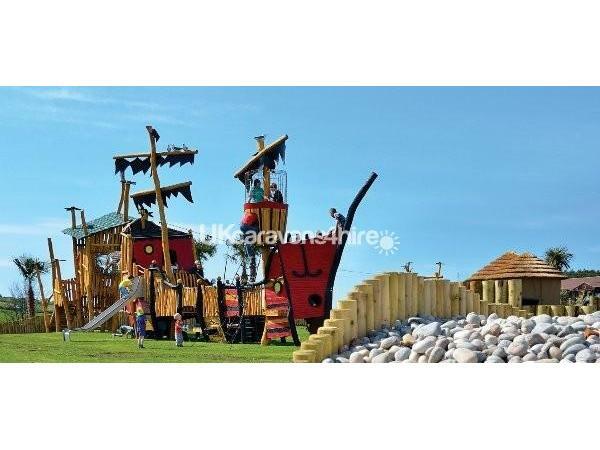 It is located on a idea part of the site .. Close to the beach and also great woodland area. Would recomment this caravan . Had a great holiday at this caravan would definitely recommended. 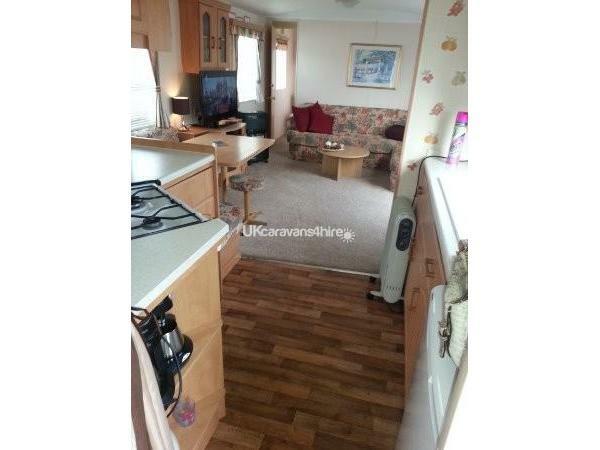 Caravan is very clean and tidy and situated on a quiet part of the park ideal for children to play outside. Nothing too much trouble for the owner and throughout excellent communication. Had a Great wee three day break.great place to stay.caravan spotless and clean.would definitely book again And the owner Sharron very helpful.thanks again,would definitely recommend it. Just returned from a short break with two young children 4 and 7 with lots of happy memories of a wonderful stay at this caravan. Well equipped and very clean. Lots of extras - DVD, games for the children, bats and nets - excellent. Already planning a second visit. Great holiday, caravan has everything you need and clean. It is in a quiet area but close to entertainment. Would definitely book again as really good value for money. 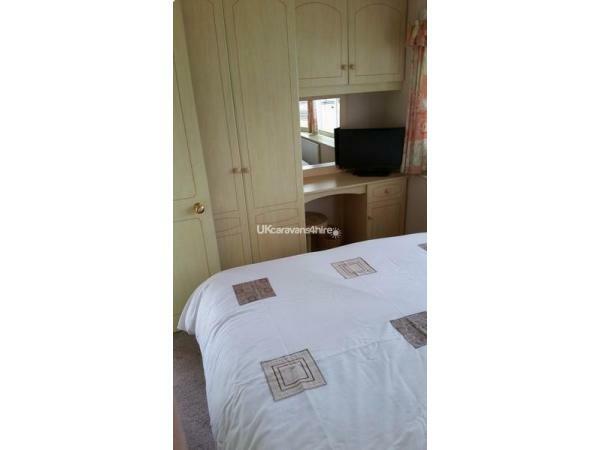 Nice clean caravan on a quiet part of the park was ideal for my family also had plenty of space thank you for a lovely time we had a very enjoyable weekend. We have just returned from a last minute stay at this lovely caravan, in Elie Holiday Park. The caravan was spotless and there was no need for us to bring Fairy/dischcloth/shampoo & conditioner, as these were all there. Our kids, age 12 and 8 loved the caravan, playing outside on the grassand the lovely beach onsite (Shell Bay), which I loved too. We felt the standard of accommodation was really good, for the rate we paid. We will be booking again, as the owner was great to communicate with and the caravan was ideal for us to explore nearby. This was our second stay; the caravan is in a lovely spot and is well kept, clean and comfortable. 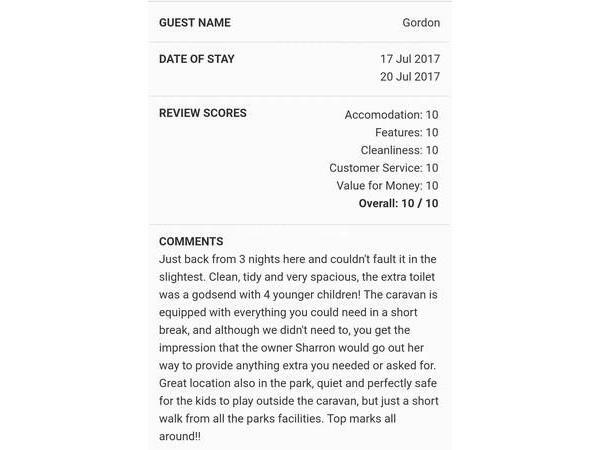 Sharon the owner is very helpful when booking and provides everything you need for a relaxing holiday. Had a lovely time, carvan had all we needed, warm and clean. Owner keep in touch and left a wee bottle of fizz and biscuits! Also cantacted us after ti say she would tie back strings on blinds in view of having a young family in. Would highly recommend and hopefully we will book again for later in thr summer. Caravan had everything we needed and is situated in a nice, quiet part of the site. The owner was very helpful before and during our stay, she was very prompt in replying to any questions we had. We had a very enjoyable four night stay at the caravan. 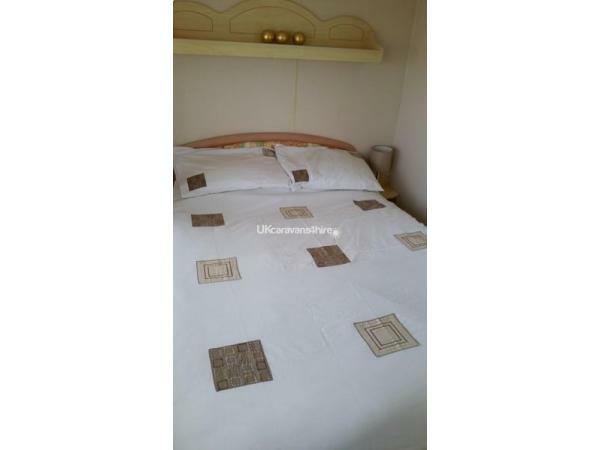 Ideal accommodation for our needs and a good location for nearby activities. When to weather is good perfect for enjoying the sunshine and on a cold wet and windy day we were warm dry and comfortable. An enjoyable few days ( mature couple but young at heart)!